An honors enhanced education is all about mind-expanding opportunities, innovation, and challenge and your time to partake is now as we launch our new initiatives and programs aimed at igniting your imagination. You’ve chosen to explore new horizons in learning and transformative education as a member of Purdue’s Honors College. There will be many choices to make including enlightening study abroad trips, pursuing research, enjoying distinctive classroom experiences with adventurous interdisciplinary formats, and opportunities to learn from each other and our world-class faculty. Being part of Purdue’s only residential college is also about becoming a member of a community of scholars, learning together and exploring ways to connect to our campus, local area and far beyond with engaged service. We’re delighted that you’ve decided to embark on this journey, and together we will forge the future! Purdue University’s Honors College fosters collaborative learning, promotes individual research and community engagement, and prepares students for a global world. We appreciate your part in this amazing experience of lateral learning. We encourage you to actively participate in this community, inside and out of the classroom. New Honors College students, download a copy of the welcome presentation here. Or click here to view the welcome video on our Youtube page. Our mission is to create and foster well-rounded, well-educated global leaders. We work to create student leaders on campus who impact society from their very first semester. The four pillars, our primary tenets, come together to help us accomplish this mission. They are: leadership development, undergraduate research, community and global experiences, and interdisciplinary academics. Numerous opportunities and experiences exist for students to develop leadership skills crucial for academic and professional success. Our student-driven organizations provide opportunities to make a difference in the Honors College, the campus, surrounding communities, and beyond. Living and learning in an interdisciplinary environment fosters increased involvement and helps develop problem-solving skills. Peer mentors help in facilitating the first-year course and lead groups of students working on projects. Undergraduate research is a built-in component of honors learning, broadening each student’s understanding of global issues. Honors students have the opportunity to work with the top instructors on campus, most of whom are award-winning professors. The thesis/scholarly project is a culmination of every individual student’s academic research experience. Interdisciplinary seminars help students understand the many complexities and issues crossing disciplines. Students engage with visiting scholars and international classmates from across the world, creating intercultural bonds of friendship. Hailing from diverse geographical and educational backgrounds, honors students practice the collaborative skills and approaches for addressing issues in the global economy. Our faculty is engaged with the students both inside and outside the classroom. Honors College activities provide fun ways to socialize and to forge friendships within the community as well as develop a culture of giving and engagement. Students are exposed to a variety of global travel opportunities that lead to academic and personal growth. The professionals at NISO mentor students through the application process for prestigious scholarships. Honors courses are comprised of students from all disciplines from across the university allowing for open dialogue and collaboration. 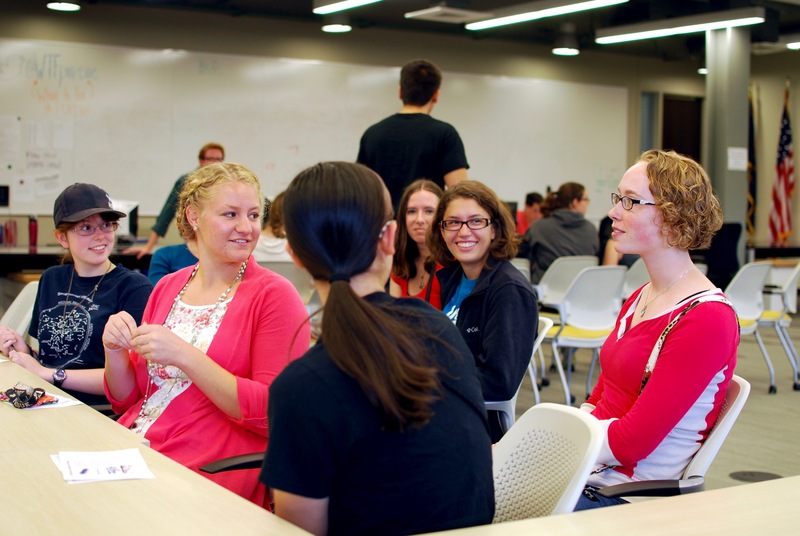 Through discussion-based honors courses, students learn from one another daily. *Continuing students must take 5 credits of HONR designated courses. Click here to download a pdf version of the curriculum. ** To fulfill the “elective honors courses (19 credits)” in the Honors College curriculum, the credit in exchange for independent research needs to be in support of the culminating thesis or scholarly project. To learn more, schedule a campus visit, or meet with a current Honors College student, please contact ncoghlan@purdue.edu.